As most of you already know I am soon leaving for a three-week arctic skiing expedition and for a such trip, you need to have chow food to keep you going. Most of the food for two people for a three-week expedition. Missing from the picture: more butter, more hard rye bread and load of bacon. As we have to carry all the food required for the three weeks, food should be energy dense and light. The basic of planning goes about like this: Protein and carbohydrates have energy density of about 4kcal per gram where pure fat has 9kcal per gram. This means that fats are favored – but only to a certain extent as the body needs also proteins, carbohydrates and starch to stay functional. In addition too large quantities of fat can cause diarrhea which is wise to be avoided in those conditions. The unassisted ans unsupported modern polar skiing expeditions often rely on a diet with fats making around 60% of the total calorific intake. This requires long-term adaptation started weeks or months prior to expedition and in addition possibly taking some digestive enzymes. So I am planning to eat a bit less fats and more carbohydrates and protein which is wise every other way but weight-wise. And as we wont be eating too much salad or fresh vegetables I will take care of vitamin and other micro-nutrients with the help of a daily multivitamin pill. In addition to being energy dense the food should also be good and easy to eat as I have to cram in over 5000kcals worth it a day. And it should be also relatively easy to cook as the cooking facilities are somewhat limited. As we will sleep and work as a two-man teams, we will take an advantage of this by cooking shared breakfast and dinner at the camp. During the days both will have their own snacks and lunches. The size of shared meals of the day is mostly limited by the volume of our cooking pot which is a bit over two liters. Other cooking gear will include a bigger pot with heat exchanger for melting snow, lids for the pots, a frying pan (pancakes! bacon! ), two white-gas stoves, an aluminum box for the stoves and kitchen utilities, etc. Another aspect that have to be taken into account while planning the food for such expedition is water. There is no running water available, except sea water and that wont work, as you know. To make our food as light as possible (or nearly as light as possible) we will rely mostly on dried or freeze-dried food that requires water to make it edible. The water is gained by melting snow on the stoves in the tent. We will melt some 4-6 liters of water per person per day so it will take quite a while and most of the evening will be spent melting water in the tent. The water needed for the next day is stored in Thermos and Nalgene bottles. The Nalgene works also as a hot water bottle in the sleeping bag during the night. 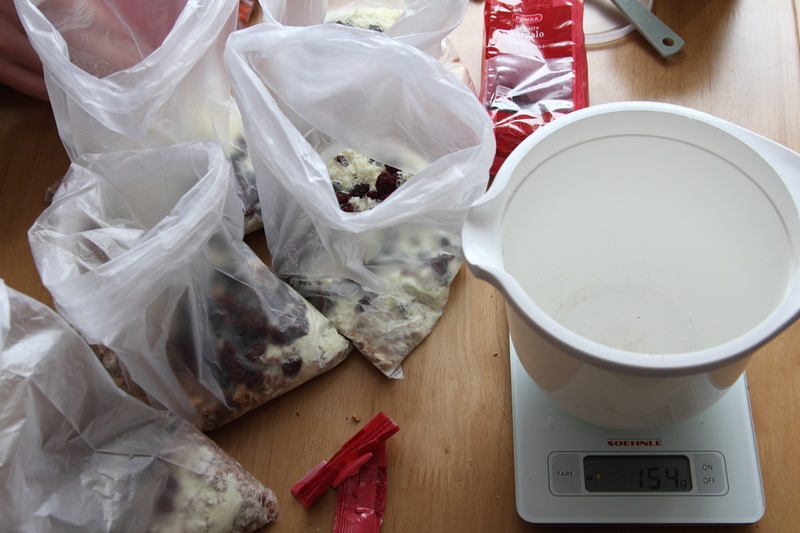 And Thermoses keep the water hot for freeze-dried lunches and hot drinks. I am personally taking two Thermoses and two Nalgenes but plan to carry “only” three liters of water during the day. I will have one liter of sports drink, one liter of hot chocolate and one liter of hot water for lunch and some extra to speed up the snow melting when in the camp. Based on these points and on my previous experiences I have made an expedition menu that should fulfill the prerequisites of giving me enough energy, being tasty and easy to cook. The morning will start with breakfast consisting of tea, hard bread and butter and oat meal, rice porridge or müesli with berries and powdered milk and likely some more butter. I believe that three different breakfast options should keep the breakfast interesting enough for the duration of the trip. During the day I will snack with 100g of chocolate, an oat biscuit, some Pringles and beef jerky. And of course drink a liter of sports drink and a liter of hot chocolate. At he halfway of the day we will have about 30 minutes lunch break and I will eat a commercial freeze-dried meal of varying sort. I have taken lunches from several different manufacturers to avoid getting fed up to a certain brand. 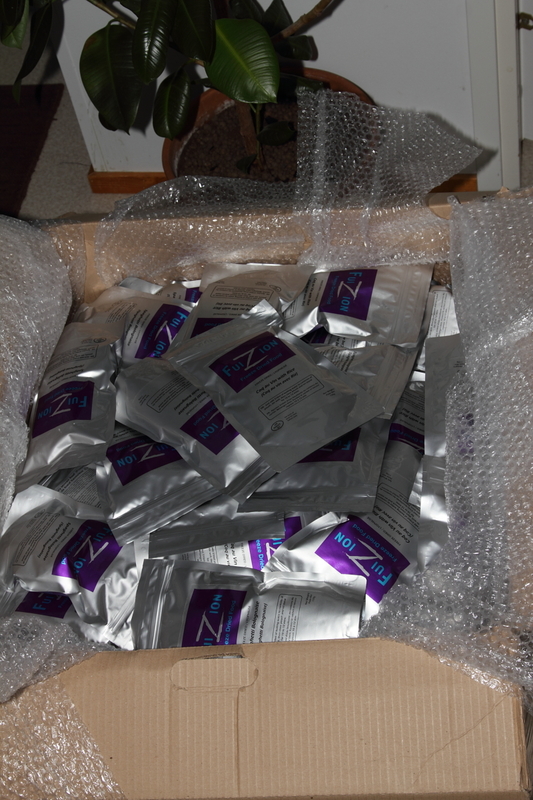 185 freeze-dried meals from Fuizion. I am taking some with me to Svalbard. At the camp we will make a dinner, the main meal of the day, from dried ingredients and butter. In addition we will have some coffee and cookies and basically eat trough the evening if we just have anything left to eat… I have also some extra desserts for about every other day and some special delicacies including some quality spirits to cheer us up after tough days and celebrate some special occasions. This all should give me average calorific intake of 5090kcal per day. 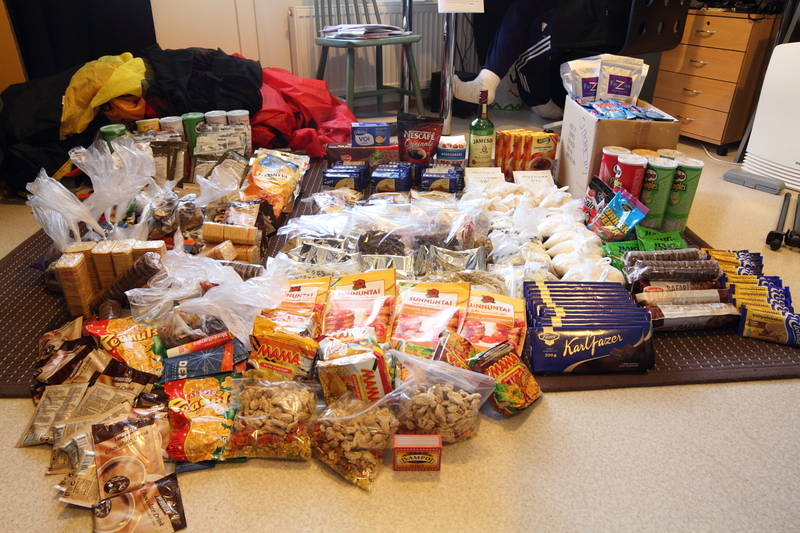 It is a lot but I still assume to lose some 4-6 kilos of body weight during the expedition. This should be no problem as I can afford it but being hungry is not fun, so I am prepared with some spare food for the second and third week. (My experience is that my appetite rockets at the end of first week of hiking or skiing.) But I do not intent to eat the spare food if I do not feel especially hungry or miserable with the planned diet. Weight-wise this is somewhat stupid, but I want to make sure I’ll have good time and on the other hand I want to find out if my body can scope prolonged exercise with the planned diet. – total: whopping 106900kcal and 25,5kg of food! – 40% of total energy from fats, 50% from carbohydrates and 10% of proteins. In addition 45 grams of startch and a multi-vitamin pill per day. And those who take this stuff far too seriously (like I do) can find a detailed pdf-file with all the nutrition and weight information (there are minor mistakes and some numbers are more or less guesstimates but it should be good enough) from here: UltimaThule2011_food. So, what do you think? Is that enough food for a 25 year old 100 kilo male? Have I forgot something important or am I having something redundant?